I’ve been anxiously waiting for a book that I’ve had on hold at the library, and finally got it into my hot little hands yesterday afternoon, after a wait of about three months. I’m already finished reading it. In fairness, it’s a short book, easily digested, but it is FULL of GREAT and USEFUL IDEAS. 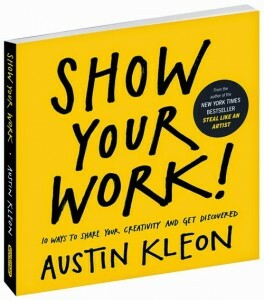 That book is “Show Your Work” by Austin Kleon. Do you know him? If not, you should check him out. Particularly if you are a creative type person. His first book, “Steal Like an Artist” is also right on the money. You can find out all about his books and his blackout poetry at www.austinkleon.com. I’ve been thinking about this concept – showing my work – for a few months now. Ever since I started on the journey of The Artist’s Way, back in August. A journey which is coming to an end this week. I’m a changed person because of it. I’ve got lots of ideas brewing in this brain of mine. I’m smack-dab in the middle of working on a Young Adult novel – called “New Summerland” – as part of NaNoWriMo. This very blog you’re reading right now is scheduled for a New Years overhaul, and I’m pretty excited about it. I’ve got a better idea of what direction I’m heading in, and I’m excited to share it with you. I’ve been enjoying this new process of showing my work on a regular basis. I thank you for going on this ride with me, and sharing your work with me. We’re all in this together. We are all students and teachers, simultaneously. Go forth and create! And show me what you’re working on!